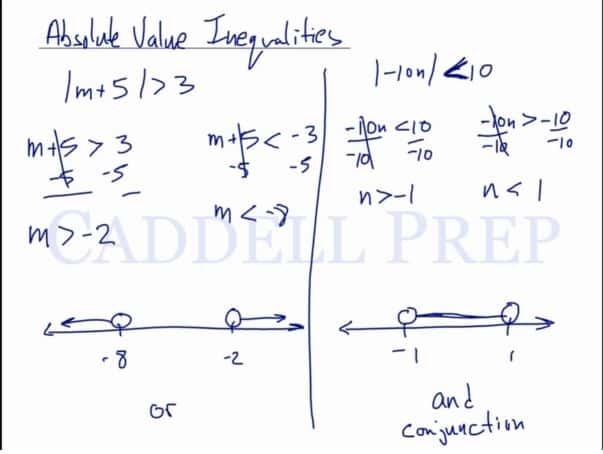 In this video, we will be learning how to solve Absolute Value Inequalities. Remember to graph your inequalities! When removing absolute value brackets, remember to flip the inequality sign and negate the other side of the inequality! Let’s go over solving absolute value inequalities. We’re going to combine our knowledge in solving absolute value equations and solving inequalities. If we multiply or divide by a negative number, we flip the sign. In the first inequality, we keep the sign because the answer is positive. In the second inequality, we flip the sign because we’re going to come up with a negative. If we graph this, we have a number line that starts with and ends with . Draw an open circle at and draw a line going to the right since is greater than . Next, draw an open circle at and draw a line going to left. Since the absolute value is in itself, we proceed to have two inequalities. We flip the sign on the second inequality because we have a negative. Let’s flip the sign because we’re dividing by a negative number. Again, let’s flip the sign because we’re dividing by a negative number. Let’s graph this using a line number which starts at and ends with . Let’s draw an open circle at then draw a line going to the right. Then let’s draw an open circle at and then draw a line going to the left. This is an example of a conjunction “and”. While the other is an example of disjunction “or”. So, a good key to knowing if you’re going to have a conjunction is to look at the original inequality. If the absolute value in itself has a less than sign, which sort of looks like a letter “c” then it’s going to be a conjunction. And if not, then it’s going to be a disjunction “or”. Now, let’s get these two. Let’s solve the first inequality. Since the absolute value has a less than sign, we know from here that we’ll have a conjunction. We flipped the sign on the second inequality because we have a negative sign. Let’s graph this by drawing a number line which starts at and ends with . Let’s draw a solid circle at and a line going to the right. Then draw a solid circle again at and a line going to the left. Two lines met so we have a conjunction. Let’s get the absolute value by itself by subtracting on both sides. Then the other one. Here we are expecting it to be a disjunction because it’s greater than. Let’s graph this by drawing a number line which starts at and ends at . Then draw a solid circle at and an arrow going to the right which is everything greater than. Then draw a solid circle, too, at and an arrow pointing to the left which represents numbers less than. So as you can see, this example is a disjunction. Same as we expected.